I can't find the exact text of the story at the moment, but I've had this running through my head most of the day. Early in the days of Jack Kirby starting to work on the Fourth World stuff for DC, he stopped into DC's offices. He met with, among others I'm sure, Carmine Infantino who was art director at the time. 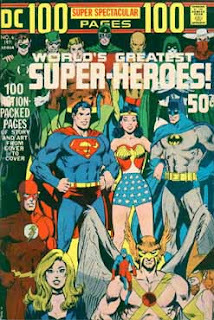 Evidently Infantino had just gotten a copy of Neal Adams' cover to DC's 100 Page Super Spectacular #6 and was gushing over it. "Well, look at them. Superheroes are all about action, but these guys are just standing around. They should be running and flying and moving. This is way too static." Infantino disagreed, obviously, as he ran the cover as is. I can't say for sure, but I think Adams did agree with Jack on this and took it as a learning opportunity. Me? I happen to agree with Jack too. Agreed...also I don't particularly care for Anderson Cooper as Reed. It's a nice enough picture, but my brain doesn't seem to be recognizing these four figures as Reed, Sue, Ben, and Johnny. Additionally, and I can't believe what a geek I am for saying this, that hand gesture of Reed's is out of character. Maybe not as much as when JMS had him say "yeah", but close to it. And of course I would dread seeing what Millar had planned for my favourite science-heroes, if I had any plans to read this comic. Which I don't, really. I don't even know what it would take to lure me back to FF comics in the foreseeable future, short of the installation of Messner-Loebs as writer. But the FF in this picture looks funny to me, anyway. And I'm not even criticizing, I'm just saying they look funny. And, you know, I find the composition very distracting there, too. 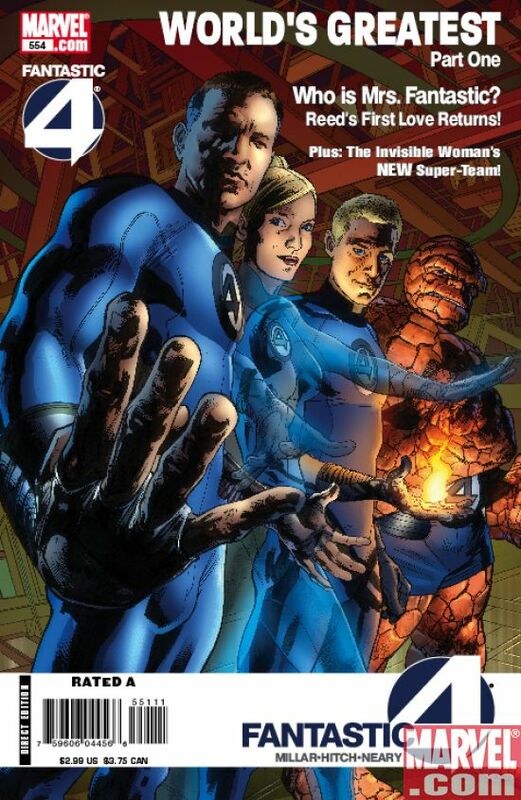 Maybe it's just the smaller image, but Sue's transparent hand crossing over with her other transparent arm, and Johnny's hand/arm, and then you think you see Reed's left arm there but you don't...and then that seam on Reed's left shoulder makes me think I'm supposed to recognize another transparent outline of something-or-other thing there, but there isn't one. And then I always don't understand why he's not holding his hand out, but unnaturally up instead, which I guess is the stretching but it doesn't look like stretching. And I'm no Toth, but I know when I'm having to think about something when I don't want to think about it. You can really, really see Reed's fingernails, and then Ben is way down the end there, doing nothing, looking like Yarn Man, and there's something screwy about that. If you think about it, I guess the idea with magazine-typeface is that this looks like a photo taken as Reed holds his hand out to say "please stand back, sir", but it isn't like that at all, it's some sort of deliberate pose. Overall, as far as just standing around goes, I have to say I much prefer the back cover of the FF Treasury. And Ben should probably not look like Yarn Man. No, this image doesn't wow me. Tom Brevoort seems like a good guy, but (admitting that I haven't actually read any current Marvel Universe stories for some years) I have to say that I scratch my head at his apparent editorial choices in general, nowadays. It seems like the Marvel Universe itself is treated as little more than a line of action figures, rather than a coherent fictional world inhabited by characters with any long-term consistent logic. And, seemingly, Tom is on-board with this. Admittedly, if Marvel is now primarily in the business of licensing properties rather than telling stories, I can't deny that it may be just as well to treat the comics themselves like any other licensed-character product. I guess it just seems odd, to me. Old habits, etc. Gah! Everytime I look at this thing, I find more reasons to dislike it!